Dr. Anna Hamling, faculty member in Culture and Media Studies, spent seven days at the Parliament of the World's Religions assembly in Toronto (2-8 November, 2018) where she moderated sessions, participated in fascinating lectures on different religious traditions and joined in various ceremonies of Indigenous peoples. The assembly brought together over 8000 participants from 52 countries. It is the largest event in the world where people gather to talk about strategies to achieve peace in the world. Anna was fortunate to meet many remarkable people during her time at the assembly including Margaret Atwood, relatives of Martin Luther King Jr., and many Indigenous peoples from different traditions and parts of the world. Anna was particularly pleased to meet and talk with Arun Gandhi, the fifth grandson of Mohandas Gandhi (Great Soul), the key player in India's independence from Britain. She is currently teaching a course on the Icons of Non-violence in which her students read some of Gandhi's philosophical work. 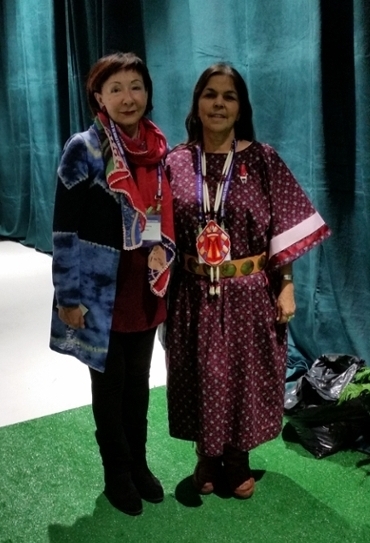 She also met Donna Augustine, a Mi'kmaq elder from Elsipogtog First Nation. Donna is interested in coming to UNB to share her stories with students which will provide more opportunities for future cooperation and sharing of knowledge. If you are interested in learning more about Dr. Hamling's experience at the Parliament of the World's Religions or her courses, email her at ahamling@unb.ca.